Why did Miles Bridges draw so few free throws? And how much does it matter? A detailed stats and film breakdown provides one hypothesis, and one approach to thinking about free throw stats. Today’s article comes from me, with support from contributor Bjorn Zetterberg. Bjorn spent seven years as a video analyst and video analyst manager for the Portland Trail Blazers, breaking down thousands of hours of film in in-depth detail. You can reach him by email at bjz2442@gmail.com. Miles Bridges has been an intriguing NBA prospect going back to high school, when ESPN ranked him as the eighth-best player in the class of 2016, right between Markelle Fultz and Malik Monk. 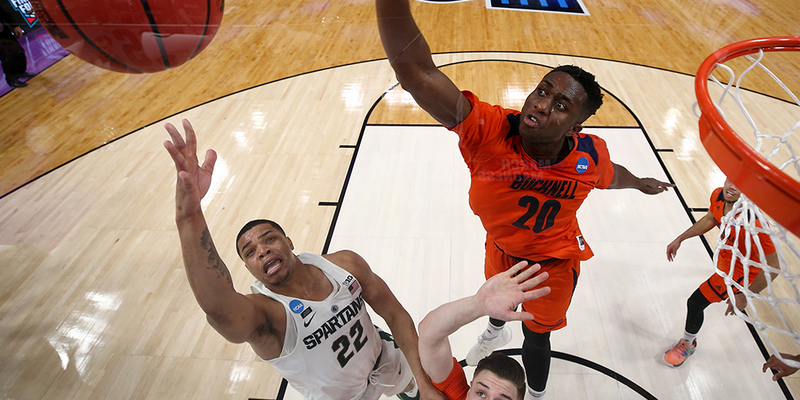 He had a chance to be a lottery pick last year, but decided to return to Michigan State for his sophomore season. Most mock drafts have him going among the top 15 picks next week. But there’s a glaring red flag on Bridges’ résumé, one that NBA teams would be wise to study: He struggles to get to the line. This past season, he took only 109 free throws despite attempting more than 450 field goals. That rate of 23.8 free throws per 100 field goal attempts is startlingly low, and it wasn’t much better his freshman year (25.3). Bridges’ free-throw rate this past year places on just the 16th percentile of seasons amongst players who made the NBA and took at least 25% of their shots from three-point range since 2009-10.